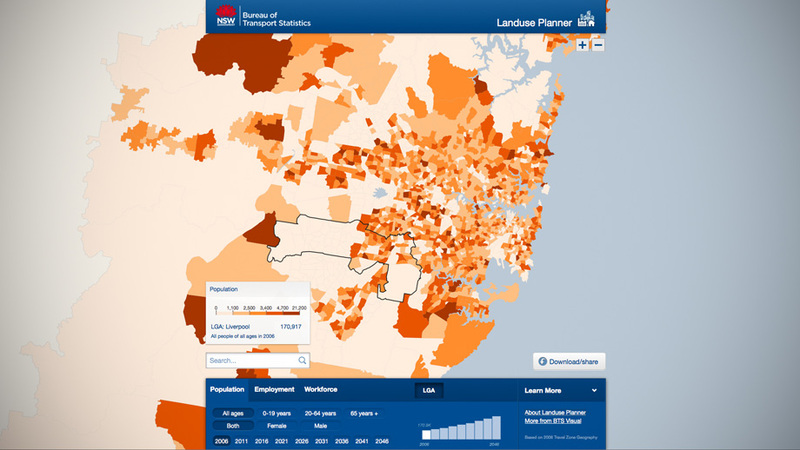 OOM Creative - in partnership with Arup - are developing a suite of new data visualisation interfaces for the NSW Bureau of Transport Statistics (BTS). This project sees the release of 7 interfaces to explore BTS data sets that have traditionally been supplied as spreadsheets or static maps in PDFs. These interactive visual tools are designed to be useful for planners and transport experts, as well as accessible and utilised by the general public. The interfaces range from finding data for specific locations through to more complicated presentations of data through thematic maps and interactive diagrams. In conjunction with the types of visualisations an equal range of technologies have been used to allow visualisations to be accessible on legacy or enterprise systems, tailored for mobile use, or designed to utilise the advantages of modern desktop browsers. More information will be presented here once the final interfaces are publicly released later in 2014.